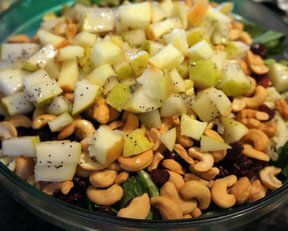 I was pleasantly surprised with the pears in this salad. The amount of sweet from the fruit and salty from the nuts. You'll be asked for the recipe over and over again. 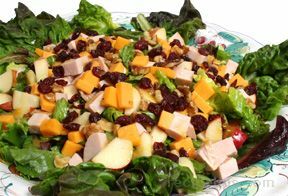 In a salad bowl combine the cheese, pear, apple, cranberries and lettuce. 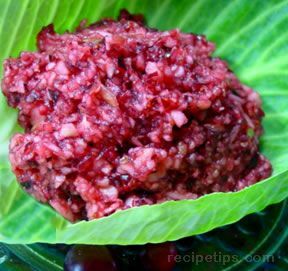 In a blender or food processor, combine vinegar, onion, sugar, lemon juice and salt. Cover and process until blended. With the blender running, gradually add the oil. Add the poppy seeds and blend. 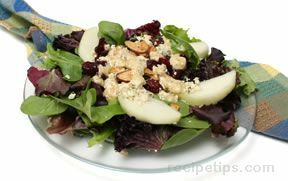 Just before serving, drizzle the desired amount of dressing over salad. Add the cashews and toss to coat. Serve immediately. "This is absolutely delicious! Curiously, I always try something new when bringing a dish somewhere and I made this for our neighborhood picnic last night. The pears were weird to me but they made the salad. Nothing was left so it was a complete hit!"